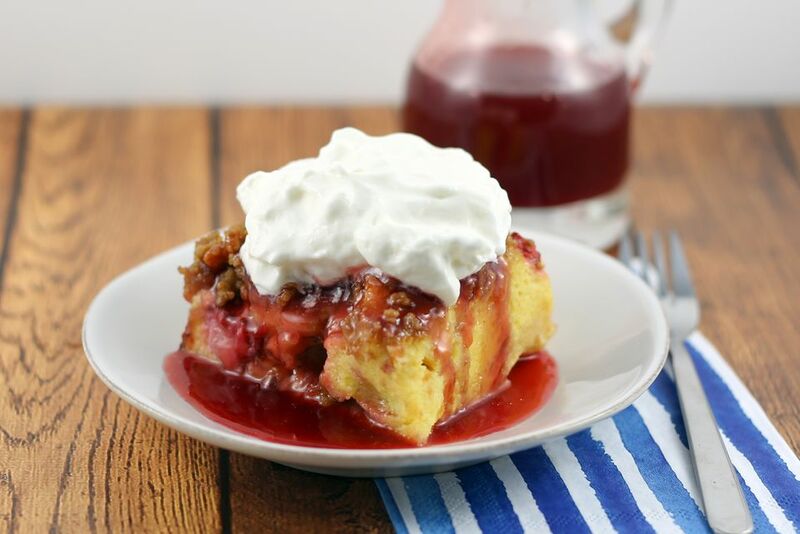 The strawberry syrup intensifies the flavor in this strawberry shortcake French toast casserole. This is an excellent summer breakfast treat or cookout dessert. Top it off with a dollop of freshly whipped cream just before serving or use thawed frozen whipped topping. Brioche bread was used in the pictured French toast bake. Biscuits, croissants, or a good quality French or Italian bread may be used as well. You'll need about 3 pints (about 6 cups) of strawberries for this recipe. Fresh is best for the casserole, but feel free to use frozen (unsweetened) strawberries to make the syrup. Put the 4 cups of coarsely chopped strawberries in a deep saucepan. Add the 1 1/2 cups of sugar and 1 1/2 cups of water. Bring to a full boil over medium-high heat. Watch it carefully—the sauce mixture can boil over quickly once it comes to a boil. Immediately turn the heat to low or medium-low and continue cooking for 30 minutes. Combine 1 tablespoon of cornstarch with 1 tablespoon of cold water and stir until smooth. Stir into the syrup mixture and continue cooking for about 1 minute longer, until thickened. Strain the strawberries through a fine-mesh sieve over a bowl. Discard the solids. Cover the syrup and refrigerate until serving time. Makes about 2 1/2 to 3 cups of syrup. Lightly butter a 9-by-13-by-2-inch baking pan or spray it with nonstick cooking spray. Slice the bread into 1-inch cubes. Layer half of the bread cubes in the prepared baking pan and top with 1 cup of sliced strawberries. Repeat the layers with the rest of the bread and the remaining 1 cup of sliced strawberries. Set aside. In a large bowl, whisk the eggs with the milk, 1/3 cup of sugar, the salt, 1 1/2 teaspoons of vanilla extract. Pour the mixture evenly over the bread and strawberry mixture. In a small bowl, combine the flour, brown sugar, cinnamon, and the pieces of butter. Work with a pastry blender or fingers until crumbly. Sprinkle evenly over the casserole. Bake for 45 to 55 minutes, or until set. Remove from the oven and let stand for about 10 minutes. Beat the whipping cream to soft peaks; beat in the powdered sugar and vanilla extract and continue beating until it holds well-formed peaks. Cut the strawberry shortcake French toast casserole into squares. Serve with the cold or slightly warmed syrup and whipped cream. Add about 1/2 to 1 cup of fresh blueberries to the French toast mixture along with the sliced strawberries for a Fourth of July dessert.